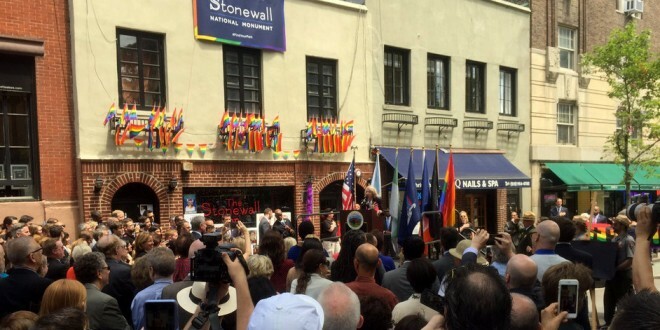 NEW YORK CITY: Edie Windsor Joins Feds & Pols For Dedication Of Stonewall National Monument [VIDEO] - Joe.My.God. Today in Christopher Park in New York City we celebrated the designation of the Stonewall National Monument, the first national monument that honors the history of LGBT community in the United States. Thank you, Tommy, for such a gracious introduction. It’s an incredible privilege to share this historic day with an iconic trailblazer in the fight for LGBT equality, who played such a central role that fateful early morning on June 28, 1969. About four years ago, a young woman on my team had the chance to brief President Obama on an event that was about to begin. After the briefing, they chatted briefly about their upcoming birthday plans that were a day a part. When the President asked Monique what she intended to do to celebrate her birthday, she said her partner was planning a dinner with friends. Without a moment’s hesitation, the President said, “What does she do for a living?” Monique often reflects back on that casual, seemingly ordinary conversation as a profoundly meaningful affirmation of her life by the President of the United States. To me, it symbolizes the remarkable progress we have made on the path to this day. Secretary Sally Jewell, thank you for your leadership and the important role you’ve played in making the Stonewall National Monument a reality, and in helping to ensure all of our national parks tell the full, inclusive, story of our Nation’s history. And thanks to all those in the Obama Administration who worked hard to make this day happen. Thanks also to Senator Gillibrand and all of our members of Congress who are here with us; as well as to Mayor DeBlasio and leaders from New York City. And to Governor Cuomo and the elected officials in the State of New York who all contributed to make today possible. And of course, thank you to the advocates, activists, and LGBT Americans young and old, who, working over decades, bent that long arc of the moral universe toward justice.